According to well-known insider, Mary Jo Foley, Microsoft will deliver a public preview of their next operating system in late September or early October. While Microsoft hasn't confirmed what this OS will be called, it's expected to be Windows 9, codenamed internally as 'Threshold'. The "technology preview" will be available publicly, and should contain many of the features expected to launch with the OS. There's no word currently on whether it will be the only public preview of Windows 9, although as Microsoft is moving to a faster release cycle, it's unlikely we'll see as many previews as we got for Windows 8. New features that have been widely rumored to make an apperance in Windows 9 include the return of the Start menu for desktop users, virtual desktops, the ability to run Metro-style applications in windows, the removal of the Charms bar for some users, and possibly Cortana integration as well. 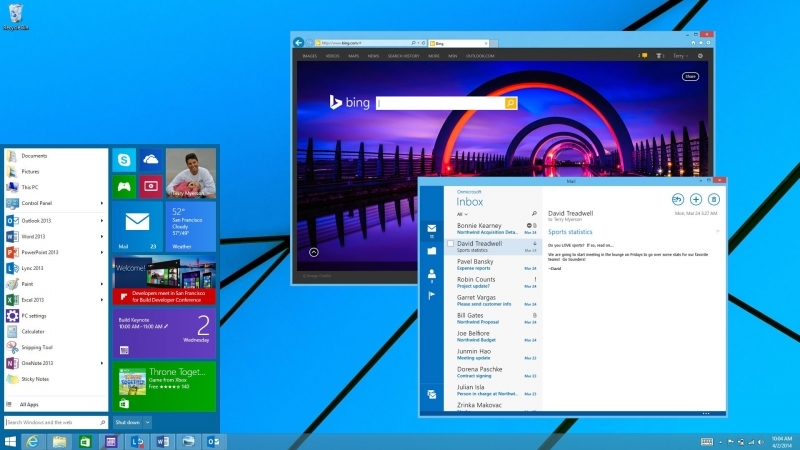 Threshold is also expected to mark the convergence of many versions of Windows into one. For example, Microsoft will merge Windows RT and Windows Phone into one version supporting ARM-based systems. The Xbox One will also receive a major overhaul to bring it inline with the current version of Windows, and universal apps will be able to run on devices of all sizes. The final version of Windows 9 will reportedly launch in April 2015, with Microsoft opting for a shorter gap between the first preview and its launch.